Includes the names: Melvin Bragg, Melvyn Bragg, Melvynn Bragg, MELVIN T. BRAGG, Lord Melvyn Bragg, Melvyn Bragg Bragg, Melvyn Bragg et al. Join writer and broadcaster Melvyn Bragg as he talks about his life, his work in television and radio and his highly acclaimed new novel, Grace and Mary. In the novel, John visits his ageing mother Mary in her nursing home by the sea, and mourns the slow fading of her mind. Hoping to shore up her memory, he prompts her with songs, photographs and questions about the 1940s, when she was a young woman and he a child in a small Cumbrian town. Melvyn Bragg will introduce and answer questions about his new novel "Grace and Mary"
Melvyn Bragg will introduce and answer questions about his new novel Grace and Mary. Mostly set in northern Cumbria, it is the story of four generations and two remarkable women, a mother and the daughter she scarcely knew. Its themes are the power and the loss of memory, and of courage the consequence of passion. Melvyn Bragg discusses The Bible. Melvyn Bragg's book The Canterbury Tales was available from LibraryThing Early Reviewers. Melvyn Bragg is currently considered a "single author." If one or more works are by a distinct, homonymous authors, go ahead and split the author. 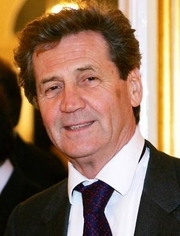 Melvyn Bragg is composed of 8 names. You can examine and separate out names.